The show Phir Bhir Na Maane…. Badtameez Dil is the latest addition in the Star Plus’ hit shows league. The show has aired hit promos with Darshan Raval’s gripping song Mere Nishaan, which makes Abeer’s entry as a popular singer. The show presents a love-hate story between the lead couple Abeer and Meher. Abeer Malhotra is a successful singer, who single handedly drives the channel by his musical show. Meher Purohit returns in his life after eight years as the new CEO of the music channel, which comes as a bad shock for Abeer. He takes this as a chance to welcome her in his way and make her life remorseful. Abeer and Meher recall their past of their love, marriage and then the divorce. The journey had some good memories, which turned bitter after their breakup. The show brings their college life shown in flashbacks, their romance, their lovely time and then few misunderstandings which ended their relation completely. They did not meet each other for eight years and lived lonely life just in their egos and not getting over each other’s love. How the couple got things ugly by the turn of the events will be shown in the upcoming episodes. Their college friends Nisaar and Sasha make an entry in couple of episodes, who are very close to Abeer and Meher. The interactions after the separation and the pain it brings for the cross path lovers forms the rest of the story. Abeer Malhotra: He is intense lover, who would do anything for his love and also hold same passion for revenge. He is rude, arrogant and annoying just for Meher. He gets friendly, fun loving and a sweet heartthrob for his friends. Abeer has distinct nature by which he can drive anyone crazy. He has good friends Nisaar and Sasha by his side since 15 years and regrets to lose Meher. He gets heartbroken after Meher signed the divorce papers against his wish. He has hatred in his heart for Meher and her entry back in his life makes him revengeful. He believes he made Meher reach the position where she is today and his big ego makes him more away from Meher. Abeer proves his fan following by rocking his music show once again. Meher Purohit: She is sweet, caring, practical, smart and an independent girl, who wants to live life on her own terms and does not want Abeer ruling her as boss. She takes charge of his channel as the CEO and starts showing him his place. She is equally hurt by the divorce and has just the memories of Abeer and their love. She stopped caring about him after many years of separation and meets him just as his boss. Meher is responsible towards her family and also an amusing friend. She is still friendly with her college mates Nisaar and Sasha. Meher plans to change Abeer’s control on the channel. Nisaar: He is the cool dude of the show, who can bear anyone’s frustration and still keep his patience. He has been a fun lover in college and everyone’s good friend. He tries maintaining things calm between Abeer and Meher. He believes not all memories are bad and calls Meher more crazy than him to get married to Abeer. He is Abeer’s friend since 15 years and has seen the journey of Abeer and Meher’s love. Nisaar works with Abeer and Meher. He is also a singer by profession and a charmer by nature. Nisaar makes Meher smile even in toughest times. Sasha: She is a crazy free bird who loves to hand out with her friends. She is very close to Abeer and wants him to reconcile with Meher. She is their college days and tries to revive the old days by a small get together, where she insists Meher to come. Sasha knows Abeer very well and does not believe his hatred for Meher. Sasha likes Abeer and wishes happiness for his life. Sasha believes in keeping friendship alive by whatever circumstances come in life. Abeer marks his entry in the show by his super rocking song Mere Nishaan. He has a big fan following. Meher is shown holding some grief in her heart and visits a funeral. Meher has a simple family and she does her responsibilities well keeping her past under wraps. She tells her mother that she is not affected to work along Abeer, as she has moved on all these eight years. Sani introduces Meher to Abeer and comes to know they were college mates. Abeer’s ego gets hurt when he sees Meher as the new CEO in his music channel. He believes no one can make him do anything and he is a super rockstar already. Meher knows Abeer’s show is the only grosser for the channel and makes a plan to create ten such shows and ten Abeers. Abeer gets to know her plan. They attend her welcome party and he brings his frustration out, recalling their marriage and the divorce she took against his wish. He assumes she left him for ten crores. Meher recalls his curses and breaks down. Abeer comes his home and gets warm welcome by his mum. His dad Kabir laughs on the good news that Abeer has met his ex wife who has now turned into his boss. Kabir tells Abeer to come home on time and not to expect any buffet dinner. He counts the Rs 10 crores he has given Meher from Abeer’s side for seeking divorce. Abeer replies he comes home just to get dad’s good lessons. His dad is a influential rich businessman and has difference in opinions with Abeer. He does not feel proud of Abeer as he did not make anything big in his career. Abeer gets angry and leaves. His mum asks him to have food and asks him about Meher. He says he will be prepared to face Meher tomorrow. Meher comes home upset and her mum requests her to leave the job. Meher refuses saying she will cut Abeer’s wings. Abeer and Meher pass some indirect taunts in the board meeting. Abeer returns the gift she gave him eight years before. He goes to perform on a solo number and shows his huge fan following. Abeer then quits from his channel to give a shock to Meher. Abeer is hurt recalling his past with Meher. The flashbacks show their love story and good moments. They looked just perfect for each other and hold pain in their hearts now. Sani gets worried and tries convincing Abeer. Abeer asks Meher to run the channel for eight days without him. She is sure of it as she has been running her life without him for eight years. Meher accepts his resignation heartily and scolds him. This makes Abeer feel humiliated and he withdraws his resignation. He decides to add some new spice to his show and plans to reveal his love story on his show. Meher gets shocked and stops him from doing so. Abeer cares a damn and goes on air with his love story. Abeer tells Nisaar that he would have seen Meher’s face when he visited her home and met her mum. Kabir gets Abeer’s complaint and scolds him for visiting Meher’s home. Abeer starts to reveal his love story, how a rich boy met a girl. He tricks Meher and does not reveal her name on his show. Meher’s mum Suman and Abeer’s mum Madhavi meet at a café and hope that Meher and Abeer reconcile. Abeer tells Meher that her fears will increase after he reveals his love story and starts troubling her. She gets miffed and talks to Nisaar. She asks how can he bear someone like Abeer for 15 years. Nisaar replies that he is just Abeer’s friend and she was the one who married someone like Abeer. He makes her smile by cherishing the old college days and tells how he has always been a silent listener to her anger. Abeer meets his college friend Sasha after many years. She hugs him and asks him to allow her to meet Meher. They look best buddies. Abeer reacts cool and unaffected by Meher’s presence in his life. Sasha goes to office and meets Meher. She invites Meher in a small get together, saying even Nisaar would be coming. Meher refuses as Abeer would also come, but Sasha convinces her. Meher feels lonely in the party and Abeer taunts her. He saves her from slipping, saying he would be blamed if anything happens to her. Abeer, Meher, Nisaar and Sasha return together in Abeer’s jeep. Nisaar sings on the way and Meher and Abeer recall their lovely memories of their past. 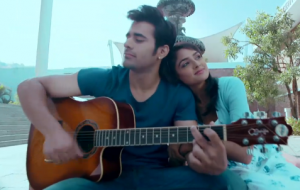 Badtameez Dil has a good start. It has nice screenplay and storytelling, which showed some fresh concept in terms of revisiting the past and how people deal with their breakups. It gets painful for people to work with her ex and how they find hard to keep personal and professional lives apart. Sometimes, profession becomes a way to settle personal scores. The show brings passionate love story of Abeer and Meher. Pearl V Puri and Asmita Sood are good in their roles. Asmita is pretty and graces the screen every time, while Pearl rocks the screen as the singing sensation and attitude thrower guy. Asmita carries off the college look and the mature CEO look very convincingly. Pearl looks best when he sings and gives attitude stares. Suyyash Rai and Vindhya Tiwari are perfect as the shouldering friends to the couple. Ayub Khan has small bit as Abeer’s dad and carries his role with ease. Rest of the cast is okay in their scene fillers. Though the scenes are more of the music channel, Abeer and Meher’s arguments and past glimpses make the show watchable. They have good chemistry in the past interactions and love moments. Darshan Raval’s songs for the show are the USP of the show. Mere Nishaan and many more tracks are solely made for the show. One can enjoy the great music, instead Abeer’s expressions while he sings. The show takes leaps back and forth as the story progresses, which holds some interest. One would wish to just see the love story between the couple, rather than their enmity phase. The show will be slowly unfolding the misunderstandings between Abeer and Meher and how they resolve their issues to unite again. The show is different from the last one on that slot. This brings a musical touch to the love-hate-love story. Though the first week looks awesome to the viewers by Abeer and Meher’s romantic past and present alter egos, the show definitely has much in store. Romantic love stories fans would love this show as it has music bits all the while. It is a good watch with relevant love story. what an idea sirji..mehbeer nd nisha!! !so good. i just love this show! amazing one! abeer is very cool! A realy good concept star plus has taken up….ths show wl rock and hope writers,directors keeps up the interest long as we realy expect a lot frm this show…. I m in love with this show. Bt ya as mentioned above abeer’s expression was very bad while singing in 1st episode. Just awesome show….I ll give 5/5 rating…. Abhir nd mehar looks great….. Nice concept…….?????? ?